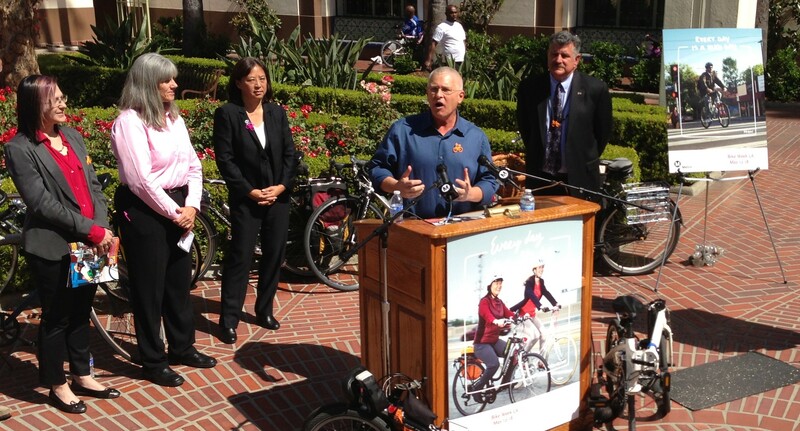 Los Angeles City Councilmember and Metro Boardmember Mike Bonin kicks off Bike Week. Standing behind Councilmember Bonin are, left to right: Jennifer Klausner – LACBC, Michelle Mowery – LADOT, Lindy Lee – Metro, and John Mukri – LADOT. Photo: Joe Linton/Streetsblog L.A.
Los Angeles’ Bike Week 2014 kicked off at a press event this morning at Union Station. Metro Deputy Chief Executive Officer Lindy Lee welcomed assembled cyclists and media. Lee expressed enthusiasm about Los Angeles’ bikeway facilities, now with “more miles than ever before.” She invited cyclists to take advantage of free rides on Metro bus and rail for this Thursday’s Bike to Work Day. There are also free rides on Metrolink and various local transit providers; see Metro’s the Source for free ride instructions. Metro is hosting and co-hosting numerous Bike Week events, including a Wednesday ride and Bike Night at Union Station this Friday. Los Angeles City Councilmember and Metro Boardmember Mike Bonin proclaimed that “bicycling is on the rise in Los Angeles!” Bonin urged governmental entities to increase investment in more and better bicycle facilities to create a more holistic transportation system. The Los Angeles City Transportation Department’s (LADOT) Michelle Mowery celebrated the city’s recent uptick in bicycle facility implementation. LADOT has achieved, and often greatly exceeded, the city’s commitment to a minimum of 40 miles of bike lane each year since 2011. Good Samaritan Hospital CEO Andy Leeka invited cyclists to tomorrow morning’s 11th Annual Blessing of the Bicycles. Rounding out the speakers were Los Angeles County Bicycle Coalition (LACBC) executive director Jennifer Klausner and Cyclists Inciting Change through Live Exchange (C.I.C.L.E.) executive director Dan Dabek. The highlight of this morning’s kickoff was the LACBC’s new report: L.A. Bike and Ped Count 2013: Bicycle Findings and Recommendations. The report includes analysis of last fall’s bike count, including comparing data from 2011 and 2013. The bike count data is very important; how often do cyclists hear that “nobody biskes” on a specific street? The bicycle and pedestrian count is a multi-day, primarily volunteer event hosted by LACBC in partnership with other nonprofits. Overall, for city of Los Angeles locations counted in both 2011 and 2013, the number of cyclists increased 7.5 percent. On streets with new bike lanes since 2011, the number of cyclists doubled. The observed increase was 103 percent. On streets with new sharrows since 2011, the number of cyclists increased 132 percent. Bicycling counts are highest on bike paths, near universities, and in low-income communities. Compared to non-bikeway streets, streets with bike lanes see less wrong-way cycling and less sidewalk cycling. Just less than half, 46 percent, of cyclists counted were wearing helmets. Design streets for people of all ages and abilities. Build a network of protected bikeways. Engage communities directly in design of their streets. Increase opportunities for bicycle safety education. Increase funding for walking, bicycling, and Safe Routes to School. In Los Angeles County, 19 percent of trips are made by bicycling or walking, but these modes receive only 1 percent of transportation funding. Measure results: do more bike and walk counts. In other Bike Week news, Mayor Garcetti bicycled to work this morning. It was apparently an unannounced low-key trip, shared on Instagram and Facebook. Do you know if the actual counts from the study are available anywhere? I’ve looked through the website and the “detailed report”, but the report just includes the summary statistics that you mention here. I’d like to look at more specific numbers to see if there are any other interesting statistical patterns to think about (and also to see if I can interpret what that 7% figure means). When I click, all the locations seem to have 0 counts, but I’ll check more later, and possibly e-mail Eric Bruins.